Most of us who run courses in traditional institutions still have to comply with the University/School regulations and associated constraints, particularly the constraints of assessment. This has been an ongoing issue for many who have participated in MOOCs. There is also the problem of open. Many institutions simply will not ‘open up’ their courses or learning environments to ‘outsiders’ and this then means that the ‘massive’ element of MOOCs is immediately compromised. Only the ‘online’ and ‘course’ parts remain. However, all is not lost. 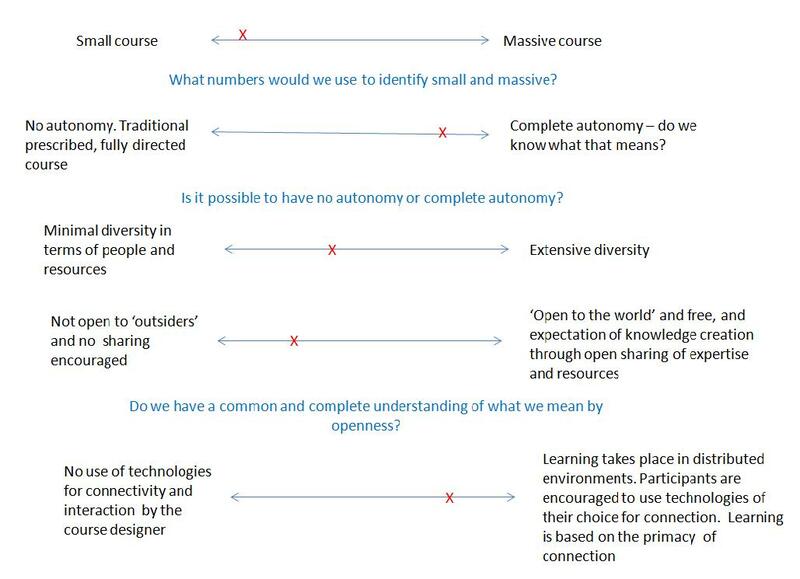 Recently, I have increasingly been thinking that it is not the MOOC itself that it is the important change; it is what MOOCs say about the associated learning principles, autonomy, diversity, openness and connectedness. These principles can be applied in a greater or lesser degree to any course, however small or closed. Autonomy can be encouraged on a whole range of levels, diversity can apply to resources if not to people, openness can apply to open sharing if ‘open to the world’ is not possible and connectedness can apply even in small environments because everyone has access to the web. Last year I had a go at writing an online course applying the principles as best I could within the constraints in which I was working. I took those four principles and worked out how far I could push the boundaries. I used many of the ideas that have been tried and tested by Stephen and George, but on a much smaller scale. It helped me to think of the principles as being on a continuum from a small traditional closed online course to a massive open online course. So for example at one end of the continuum there is no or very little autonomy and at the other end there is complete autonomy (if we know what that means, which is debatable). If we place our courses on this continuum for each of the principles of learning in MOOCs, and also possibly for how ‘massive’ the course is, we can then see how close or far our course is from the MOOC ideals. This diagram is not intended to be precise – just an indication of how the principles are likely to be experienced in the course. Maybe fearing and loving MOOCs is also on a continuum. At what point on a continuum would we place ourselves and why? Your sliders picture is a great visualization of the principles. I am not sure, though, if high diversity is possible without large size, and I doubt that the missing participants’ diversity can be compensated by diversity of resources selected by one teacher. I think you’ve hit on an important point here, Jenny. There’s something profound to be said about style. As I mentioned in my other comment, it’s the ‘individual’ MOOC that needs to be defined. While I may have concerns about the level of facilitator involvement (or avoidance, as I see it) in one MOOC, another is not restricted to such a set degree. This may make it difficult to draw any sort of lines between what are ‘courses’ and what are not, but in the end, that shouldn’t stop anyone from putting together the types of instruction that they feel is best suited for their situation. The name is just the name….although I guess this still leaves the distinction of what a MOOC is up for debate. Maybe the purpose of the distinction is just to help get education out of the rut it’s been in for so long. Hi Matthais; Is there a need for such a wide diversity, since the number of participants and thus individual intentions that make up the MOOC would also be at a smaller size? It’s the principle of autonomy that I struggle with in designing university courses, Jenny. Always, always there’s the tension between autonomy and accountability in teacher education. I feel the need to model the reflective assessment process and to do that I must have rubrics to guide self-assessment. I do believe that constrictions if wisely designed can encourage creativity so I create (and engage students in creating) the rubrics with that goal in mind. I am really interested in how the MOOC experience can help an educator begin to “open” up her teaching. Interestingly, as I look at some of the MOOC-like spin-off courses, they would be plotted all over your continuum. I think again it’s a question of how much accountability the MOOC-like facilitator feels is necessary. Thanks for this thoughtful idea of the principles on a continuum. I think your slide looks as good as a PPT slide can with an abundance of text. @Glen and Matthias – thanks for your comments, which have made me think about this further. I did wonder at the time whether the cross on the diversity line was in the right place or whether it should be further to the left. I placed I where it is because I felt that a even a small closed course that encourages learning across different environments is going to increase its diversity. Perhaps that was a mistaken assumption. However, the design of the activities can certainly increase the diversity of resources that the students come across and high levels of autonomy will encourage the students to find a diverse range of resources. So they would come across diverse people through their writing rather than socialising with them? That’s maybe stretching the argument a bit far. I’m wondering whether diversity should have two lines? One for people and one for resources – when thinking of course design? Hi Cris – thanks for your visit and comment. Two things come to mind in the light of your comment. – I’m wondering who owns the rubrics for self-assessment of the reflective process – the teacher or the student? – When working on the paper I wrote with Roy Williams and Regina Karousou – Special Issue: Connectivism – Design and Delivery of Social Networked Learning – https://jennymackness.wordpress.com/publications/ – we came to the conclusion that some constraints are needed to ensure ‘safe’ learning as a starting point in MOOCs. I’d be interested to hear more about the constraints you feel are necessary to encourage creativity. Jenny, thanks again for a thought provoking post. I like your idea of the continuum. It speaks to the multi-variant statistician in me. As to the idea of Autonomy, I do not think you can ever have no autonomy. Even in classes where there is only a sage on a stage listening to themselves speak, the student still has to take an exam. Studying is a form of autonomy. There can be complete autonomy, as in the case of some online professional and continuing education delivery systems like Element K. In these, you wok through constructed modules, complete little multiple choice assessments, then get a certificate and CEU credit. Ther is no mentor or facilitator. Your on your own. Varying levels of education need varying levels of facilitation and mentoring. The #change11 MOOC has drawn people with good computer skills, who are already engaged in the conversation to varying levels, have strong background skills, and many are competent community builders. Add to this that many are academics, and you have a high level of information filtering. With minimal input and directions, many here will work on building a learning community. But what do you do with an 18-20 year old, who does not possess these skills? What if you have a whole class who are novices? Thus my comment about building the foundations of knowledge. It is something I’ve been tackling in my blog for the past few days. @ Robert – thanks for your comment. I agree. Learning is not something that teachers can force on students. A student is always free not to listen to the teacher. >What do you do with an 18-20 year old, who does not possess these skills? My experience is that many students both older and younger and including the group you mention do have excellent technical skills, but they tend to use them more for social purposes rather than for studying. Stephen has written in the past that teaching is to ‘model and demonstrate’, learning is to ‘practice and reflect’. So from this, our job as teachers would be to take their starting point (e.g. their mobile phones) and model and demonstrate how they can be used for more effective learning. I think this is what we are going to hear about in this week’s live session. Off the top of my head, I think it’s more the mindset that is the challenge than the skills, i.e. people have to believe that it’s possible to learn effectively in the ways in which we are doing in this MOOC. Jenny, you are becoming a great resource :). Thanks for the help!